Tourmaline is a gemstone famed for occurring in nearly every color of the rainbow. Some of the colors are quite rare, such as the vivid purplish-red of rubellite, the neon blue of paraiba and the rich green of chrome tourmaline. But one of the rarest colors in tourmaline -- and one of the least known -- is a bright yellow known in the trade as canary tourmaline. Brown or black tourmaline, known as dravite, is quite common. The black tourmalines are colored by iron, while the brown and gold colors are due to manganese. Only rarely does a pure yellow occur, when the tourmaline is manganese-rich (up to 9%) with traces of titanium while very low in iron. The colors of canary tourmaline can range from a pale yellow to deep golden, but the most valuable are the bright yellows, usually with just a touch of green. Yellow tourmaline can occur wherever tourmaline is found, but the finest examples have been found in Africa, particularly in Malawi, Zambia, Mozambique and Nigeria. Specimens have also been found in Afghanistan and Pakistan. Though tourmaline is a gem that is not unusual in large sizes, yellow tourmaline is usually found only in smaller sizes, with the vast majority of cut stones under 1 carat. Thus yellow tourmalines over 2 carats count as especially rare. Like rubellite, yellow tourmaline tends to have significant inclusions. But even slightly included gems can be very attractive with good brilliance if the color is strong. An eye-clean yellow tourmaline would count as very fine. The best yellow tourmalines have exceptional brilliance with an almost neon-like quality. Since tourmaline has very good hardness (7 to 7.5 on the Mohs scale), this is a gem suitable for any type of jewelry. Usually yellow tourmaline is completely untreated. This month we feature some especially good values from our recent acquisitions. Malaia Garnet is a rare hybrid that is a mixture of pyrope, almandine and spessartite. The Malaia color is typically reddish-orange or orangey-red. A pinkish hue is more unsuual, and makes this 4.36 ct specimen particularly rare. This fine material has been expertly fashioned in a squarish cushion that is well-sized for an impressive ring. Guaranteed natural and untreated. Petalite is one of the most popular of the colorless gems. It has reasonably good hardness (6 to 6.5) and tends to display a pure white without heat treatment. This matched pair of petalite pears is completely clean and will set up beautifully in earrings. Guaranteed natural and untreated. A big, bright citrine trillion in a vivid golden orange. Completely clean and beautifully cut with portuguese faceting for maximum brilliance, this a perfect citrine for an elegant pendant. Guaranteed natural and untreated. An exceptional peridot from Burma with wonderful color saturation. This superb gem displays a pure rich green which you will rarely see in peridot. Precision cut in a square cushion, this is beautiful material with excellent crystal. If peridot is your birthstone, you will rarely see as fine a specimen as this. Guaranteed natural and untreated. A lovely large amethyst pear in a bright medium-dark purple. If you find the deep purple amethysts too dark, you'll be delighted with this beautiful stone, which combines rich color with excellent brilliance and sparkle. Guaranteed natural and untreated. A very fine yellow tourmaline -- vivid yellowish-gold with good brilliance, well cut and clean. These are quite rare over 2 carats, so this is a fine piece for the tourmaline collector. Guaranteed natural and untreated. In a memorandum dated May 17, President Obama announced that the United States would renew most of the remaining sanctions against Myanmar, including the ban on the importation of Burmese ruby and jadeite. Though a trade embargo against Burma was mostly lifted in 2012 as the country began its transition to democracy, sanctions remain on specific businesses that propped up the former military regime. Obama noted that Burma has made "significant progress since 2011," including democratic elections and the release of political prisoners but "concerns persist regarding continued obstacles to full civilian control of the government, the ongoing conflict and human rights abuses in the country, particularly in ethnic minority areas, and military trade with North Korea. In addition, Burma's security forces, operating with little oversight from the civilian government, often act with impunity. We are further concerned that prisoners remain detained and that police continue to arrest critics of the government for peacefully expressing their views." Rough diamonds are normally sold by mining companies to manufacturers at private sales. But in an unusual move the Lucara Diamond Corporation announced that Sotheby's would auction their 1,109 carat rough diamond in London on June 29. 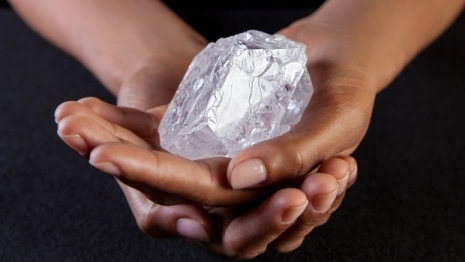 Known as the Lesedi La Rona, the enormous rough diamond is exceptional for its quality, and it is the second largest diamond ever recovered (after the 3,106 carat Cullinan diamond in 1905). Sotheby's has set a pre-sale estimate of $70 million on the gem, and there is speculation that the diamond may be purchased by a collector and preserved in its natural form. Sphalerite is a rare collector's gem that is prized for its exceptional fire or dispersion, which is higher than that of diamond. Since sphalerite is a fairly soft material (3.5 to 4 on the Mohs scale) it is not suitable for rings. But it can be set in a pendant with a protective setting. Some of the finest and largest sphalerites in the world come from the Aliva mine in the Picos de Europa Mountains in the Cantabria region on the north coast of Spain. For more information see our article Sphalerite: More Fire than Diamond. We take great care to protect our customers' data both during and after a transaction. Our checkout system uses SSL encryption to protect your credit card and personal information. When you access our shopping cart or checkout pages, you will see a lock icon in your browser, indicating that you are on a secure page. In addition, only our credit card processor sees your credit card data, and we don't keep records of any credit card information on our servers. There are also steps that you as a shopper can take to protect yourself while shopping or banking online. A major survey of online security determined that more than 50% of users do not check for an icon of a lock to see if a website is secure; 50% do not password-protect their smartphones; 55% do not close the Web browser when they are finished using an online account, which is necessary to prevent some types of hacks; and 15% keep a written record of passwords and PINs in their wallet or on a mobile device or computer.